They started building Belle Tout in 1832 and it came into operation in 1834.
Who designed the Belle Tout Lighthouse? Belle Tout was designed by William Hallett and James Walker in 1831. Construction commenced in 1832. Why is Tout sometimes spelt Toute and other times Tout? It appears to be a historical corruption in the spelling of the name or an alternative interpretation of the name. The original spelling appears to be Tout although at some point in the late 1800’s and used well into the 1900’s Toute is used. This could be a misspelling, or maybe someone thought it ‘looked’ better in the name, or perhaps they believed it to be the feminine singular of the French for ‘all’. If it is a misspelling, this used to occur quite easily due to mispronunciation or misinterpretation. My name, Wassell, has transformed over the years as you get Wassall, Wassel, Wassal, Wasel, etc. Where does the name Belle Tout come from? Some people believe it is French, as in ‘All Beautiful’, just as Beachy Head is believed to have come from Beauchef (1274 reference) and then Beaucheif (1317 reference), then becoming Beachy Head (1724 reference thereon). However, more likely the origin is Celtic taken from ‘Bael’ the ‘God of War’ and ‘Tout’ for ‘lookout’. When was the old Belle Tout Lighthouse decommissioned? Belle Tout was decommissioned in 1902 when the new lighthouse at the base of the cliffs came into operation. Why did they stop using the old lighthouse? There were two reasons. Cliff erosion which reduced the effectiveness of the light from the lighthouse and cliff top fogs. How did cliff erosion affect the effectiveness of the lighthouse? 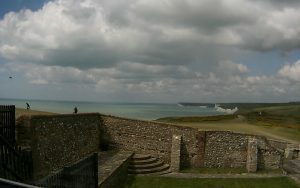 When Belle Tout was built, it was a certain distance from the edge of the cliff. This meant that if ships sailed too close to the shore, the light would be obscured by the top of the cliff. They could then recede to a safe distance when the light was visible once more. As the cliff eroded, so to did the angle of obscurity, which meant that the ships would be too close to the jagged rocks. This image shows the angle of obscurity, too close and the light is obscured which is why effectiveness was deduced as the cliff eroded. What did they move the Belle Tout Lighthouse? The lighthouse was moved by Abbey Pynford in 1999. How far did they move the lighthouse back? The lighthouse was moved 17m or 56 feet. How fast is the chalk cliff at Beachy Head eroding? The cliff is eroding at a rate of an average of 60cm per year. You can read more about the rate of chalk cliff erosion in the coastal erosion page. Will the Belle Tout Lighthouse need to be moved again? Yes, definitely although when, we’re not yet sure. Due to the unpredictable nature of cliff falls and coastal erosion it could be anywhere between 20 and 40 years. 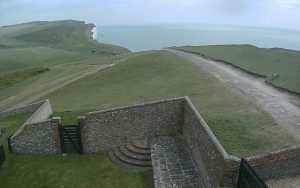 However, if the rate continues at 60cm per year we can estimate that Belle Tout will be at the edge of the cliff in 25 years. Its important that there is enough room to be able to work in front of the lighthouse on footings for the hydraulic rams, therefore it is more likely to require moving in 18-20 years from now. How easily can the Belle Tout Lighthouse be moved again? In 1999, when Abbey Pynford moved it, they built huge concrete runners underneath the lighthouse. This allowed the building to be slid backwards into position on the new lower-ground floor story that was built in the garden. Its perfectly possible for another story (or two) to be built towards the rear of the garden and for Belle Tout to be moved backwards to be positioned on top. This will increase the distance a further 15-30m dependent on final position. I understand that Belle Tout has been in many films? Yes, its appeared in films, TV programmes and even a song, called ‘Belle Tout’ by the Subterraneans from their 2006 album ‘Soul Mass Transit’. It appeared in Quadrophenia in 1979. Very famously, it was the main protagonists cliff-top love nest in The Life and Loves of a She-Devil when the BBC owned it in 1986 and made extensive temporary alternations to the building. It also made an appearance in James Bond’s The Living Daylights with Timothy Dalton in 1987. Doubling for Gibraltar, the secret agent’s Land Rover goes over the edge of the ‘rock’ and he escapes from the back by parachute. More recently, it appears in Brighton Rock, filmed in 2010. It was filmed in and around the Brighton and Beachy Head area and they they recreate a working lighthouse with lantern. This location and especially the impressive chalk cliffs have been used for Foyles War, Green Wing, Keith Barry, Little Britain, Mitchell and Webb, Scrapheap Challenge and Top Gear. In 2011, (Series 17, Episode 1), Top Gear celebrated the 50th anniversary of the E-Type Jaguar by organising a cliff-top ensemble of E-Types. This was visible from Belle Tout, just on the next hill along to the East. The South Downs have also been used to film scenes from Harry Potter, Pearl Harbour, Band of Brothers, Wimbledon and Chitty Chitty Bang Bang. What happened to the original light apparatus or optic? At the moment, we’re not sure. The original mechanism and the optic is something that we’re still trying to track down – as and when we find out, we’ll let you know. Who owns the Belle Tout Lighthouse? The Belle Tout Lighthouse is owned by David and Barbara Shaw. They bought Belle Tout in 2008, spent nearly two years renovating it and opened as a bed and breakfast in 2010. Is Belle Tout open as a visitor attraction? The Belle Tout Lighthouse is not a visitor attraction, as such, it is a ‘unique bed & breakfast’ that you can stay at. When staying, you have full access to the public rooms, including the comfortable living room and the breathtaking lantern room. When ‘Touts’, the shop, is open, you can access the grounds in front of the lighthouse and see the original foundations from where it was moved. Have you got a question about the Belle Tout Lighthouse? If you’ve got any questions about the Belle Tout Lighthouse, send me a message and I’ll answer it for you and add it to this page. I will reply so you know when the question about the Belle Tout Lighthouse has been answered.